Journal / Trust me. Wear a waistcoat. The vest, also known by the more arcane term “waistcoat,” is the smartest purchase no one makes any more. Essentially a sleeveless jacket, a waistcoat typically has four pockets – two upper and two lower – as well as a back strap that can be tightened or loosened. A waistcoat covers the torso, providing warmth in the case of a winter-weight tweed or keeping you feeling comfortable while looking cool in summer if you choose a linen, cotton or lightweight wool. 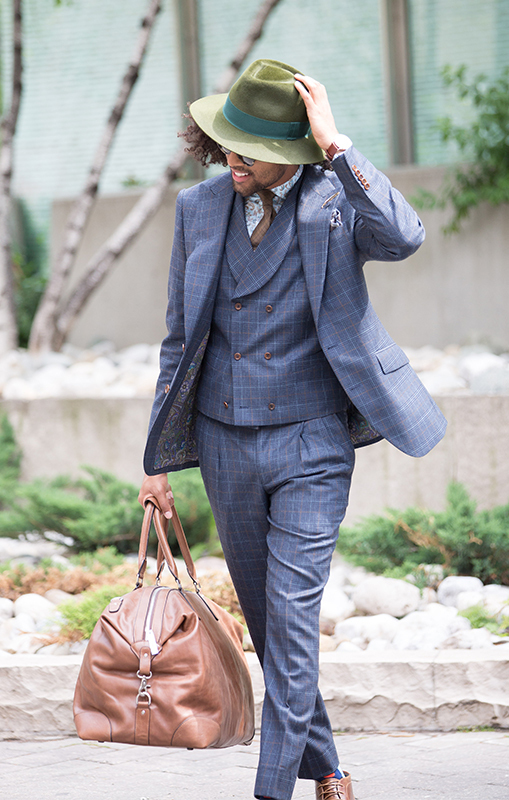 Like a jacket, a waistcoat can be either single- or double-breasted, the latter being a more formal style. This versatile garment can be worn as part of a three-piece suit or on its own with a dressy or casual suit. The origin of the vest worn as part of a suit was to conceal the unsightly braces and rumpled shirt front. Its pockets held one’s pocket watch, lighter, business cards, etc. Nowadays, a good reason to buy a three-piece suit is that you can still look professional without your suit coat on, thanks to the waistcoat. Of the three contrasting opportunities – back, lapel and pockets – the back of the waistcoat provides the largest and most visible canvas for creative expression. The safe option is to match the back of the waistcoat to the inner lining of the jacket, if it is indeed part of a three-piece suit, but you can also choose from an endless range of other contrasting options to make your waistcoat an outstanding, stand-alone garment. If your boss or a client unexpectedly drops by your office, behold the elegant figure you cut in your waistcoat and no suit jacket. Wear a vest. You’ll thank me later.